Hurtigruten Coastal 11 Day Norwegian Discovery Voyage. Enjoy the highlights of the Hurtigruten Norwegian Coastal Voyage, complemented by visiting Trondheim and Oslo, linked by a wonderful scenic rail journey. A spectacular 11 day trip that combines the highlights of the Norwegian Coastal Voyage, complemented by visiting Trondheim and Oslo, linked by a wonderful scenic rail journey. Before you check in, explore the charming port and Hanseatic city of Bergen. Stroll through the narrow medieval streets of the UNESCO-listed Bryggen quarter, visit the Hanseatic Museum or stroll among the stalls at the fish market. Take the funicular railway 320m up Mount Fløyen, located just outside the city, and you'll enjoy the best view of Bergen and its fjords. In the evening your Hurtigruten voyage sets off through the Hjeltefjord, following in the wake of the Vikings who sailed from here to the Shetland Islands and beyond. Ports visited today : Florø, Måløy, Torvik, Ålesund, Molde. 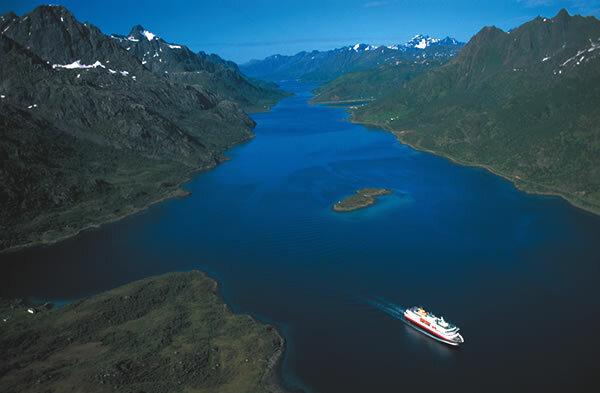 Your Hurtigruten ship navigates the skerries and islands further north before reaching Ålesund. Marvel at the inspiring architecture in the Apotekergate and Kongensgate pedestrian precinct, perfect examples of the Art Nouveau style. Don't miss out on the view from Mount Aksla but beware, there are 418 steps to the top! In the summer months, the next destination will be the spectacular UNESCO-listed Geirangerfjord. En route to the end of this beautiful fjord you pass sheer, 800m cliffs and impressive waterfalls. Ports visited today : Kristiansund, Trondheim, Rørvik. In Trondheim itself, the Hanseatic, waterside storehouses built on wooden stilts are just as charming as the Rococo-style Stiftsgården, the largest wooden building in Norway and residence for the Royal Family when visiting Trondheim. You then set a course for the northwest, past the beautiful Kjeungskjær lighthouse and thousands of little islands and picturesque rocky outcrops. After passing through Stokksund, your Hurtigruten ship will arrive at Rørvik. Ports visited today : Brønnøysund, Sandnessjøen, Nesna, Ørnes, Bodø, Stamsund, Svolvær. This morning, between Nesna and Ørnes, you pass a globe on a small islet which heralds your crossing of the Arctic Circle. Hurtigruten passengers sailing in Arctic waters for the first time are given an Arctic Circle baptism by Njord, the ruler of the Seven Seas. This comes in the form of an ice cube down your front or back, but is entirely optional. In the evening you reach Svolvær, the main settlement on the Lofoten Islands. These islands are renowned for their small, picturesque fishing villages with their bohemian atmosphere surrounded by majestic granite cliffs and white sandy beaches. Complete your visit with a stroll between the stockfish racks and 'rorbuer', the traditional, red fishermen's residences. The Lofoten Islands are a truly extraordinary experience. Ports visited today : Stokmarknes, Sortland, Risøyhamn, Harstad, Finnsnes, Tromsø ,Skjervøy. During the night your Hurtigruten ship navigates the narrow Raftsund strait. After a stop in Harstad, situated on the largest island of Norway, Hinnøya, you continue via Finnsnes to Tromsø for a prolonged stay. Many of the epic Arctic expeditions used Tromsø as a starting point; the famous explorer Roald Amundsen sourced both crew and supplies here. With the presence of the Norwegian Polar Institute, the city has cemented its position as the Polar Capital of Norway. Ishavskatedralen, the Arctic Cathedral, is the most famous landmark with its modern design and extraordinary stained glass window. Tromsø is also home to the world's northernmost university and the large number of people arriving here has created a vibrant cultural scene with numerous restaurants and cafes constantly teeming with life. Ports visited today : Øksfjord, Hammerfest, Havøysund, Honningsvåg, Kjøllefjord, Mehamn, Berlevåg. Following the scenic sailing through Magerøysund and after an early stop in Hammerfest, you arrive in Honningsvåg. This small port is the gateway to the wonders of the spectacular North Cape which rises 300m from the ocean, and at 71° 10' 21" north it puts you a mere 2,000 kilometres from the Geographical North Pole. Standing atop the North Cape Plateau you'll get the eerie feeling of being at the end of the world. The area is also known for its bird life, and Gjesværstappan, a bird sanctuary with up to 250,000 seabirds is home to some High Arctic species that can only be observed here on the Norwegian mainland. This evening, as you approach Kjøllefjord, you pass a rock formation that is sacred to the indigenous Sami people, Finnkjerka. Ports visited today : Båtsfjord, Vardø, Vadsø, Kirkenes. Being at the north-easterly terminus of Hurtigruten, the only choice from here is to set south again but spending a few days in Kirkenes offers you the opportunity to take part in some of the adventurous Arctic activities available nearby. Ports visited today : Mehamn, Kjøllefjord, Honningsvåg, Havøysund, Hammerfest, Øksfjord, Skjervøy, Tromsø. Breakfast at the North Cape including a visit to a Sámi family form part of an early morning excursion (at extra cost). Your next stop, Hammerfest, was a settlement back to the Stone Age and is still playing an important role as a fishing port. Founded in 1789 to develop trade with Russia, Hammerfest reconfirmed its position as Norway's Polar capital of its time, acting as a base for hunting expeditions to the High Arctic. In Hammerfest the Meridian Column, erected in 1854, commemorates the first precise measurement of the globe, an achievement so important that it's become a UNESCO World Heritage Site. As early as 1891, wave energy provided power to the first electric street lighting in Northern Europe, and energy innovation is still a signature for Hammerfest with its large Liquid Gas Plant just outside town. From here, your next major stop will be Tromsø where you are invited to take part in a very special musical experience, The Arctic Cathedral Midnight Concert. Or why not head to one of the town's many friendly pubs and sample the local brew, Mack's Arctic Beer. Ports visited today : Tromsø, Finnsnes, Harstad, Risøyhamn, Sortland, Stokmarknes, Svolvær, Stamsund. The Vesterålen and Lofoten Island are amongst today's highlights. Before you reach them, you pass through Risøyrenna, a channel that was specially constructed for Hurtigruten, providing the vessels an 'inside route' between Harstad and Sortland. Stokmarknes, where Hurtigruten was founded, is the location of the Hurtigruten Museum. Entry is free for all Hurtigruten passengers. You continue through the narrow Raftsund, the picturesque narrow channel between the Vesterålen and Lofoten Islands, where, time and weather permitting, you'll take a detour into the spectacular Trollfjord where steep cliffs hug the ship's sides. Then it's on to Svolvær, the main settlement on the Lofoten Islands followed by Stamsund where the majestic peaks of the huge Lofoten Wall can be viewed. You leave the islands during the evening and set course for the mainland. Ports visited today : Bodø, Ørnes, Nesna, Sandnessjøen, Brønnøysund, Rørvik. The Helgeland coast with hundreds of islets, fertile farmland and steep granite walls is worth getting up early to experience. Today will also be your last one north of the Arctic Circle as you cross it between Ørnes and Nesna. This part of the coast is rich in local lore with stories including the legend of the Seven Sisters, a picturesque row of peaks, and the myth about how the arrow from Hestmannen's bow formed the hole in Torghatten Mountain. The Vega Archipelago, a UNESCO World Heritage Site, is close to your call in Sandnessjøen. The islands were inscribed on this prestigious list due to the unique interaction between man and nature - over centuries the local population have protected the eider duck nests in return for the highly valuable down from the birds. Disembark your Hurtigruten ship in Trondheim in the morning. Extend your stay for one night to explore more of Trondheim before boarding the train for an unforgettable journey through truly stunning scenery to Oslo. Stay for 2 nights in Oslo to discover Norway's lively capital city before flying home. Leave Trondheim in the morning by train for Oslo. Arrive in Oslo mid-afternoon for a two-night stay with time to discover this lively capital city. Perhaps enjoy a visit to the Fram, Viking Ship or Natural History Museums, take a stroll through the Vigeland Sculpture Park, or marvel at the architectural splendour of the Royal Palace located at the top of Karl Johan's Street. This very walkable city also has a wealth of cosy cafés if you just want to sit down and watch the world go by. One of the unique features of the Hurtigruten voyage is that with daily departures throughout the year you can choose the date and ship that suits your taste. With several UK airports to choose from this gives you great flexibility to decide your own schedule. See FLIGHT PACKAGES below. Daily between 1st January - 31st December. All prices are shown in £s per person, based on two people travelling together and sharing a twin cabin, voyage only. The ship departure date determines the price of your voyage. Please also see FARE OPTIONS to see what is included in the different fares. Cabin Single Supplements available on request. The price you pay for your cabin will depend on when you book. Early bookers will get the 'from' price. As the cabins get booked up, the price will rise towards the 'to' price, which is the highest fare that you will pay. It is strongly advised to book early to get the best fare. • Voyage in cabin grade of your choice on a full board basis. • English speaking tour leader on board. • Entrance fee to the Hurtigruten Museum. Hurtigruten can offer flights with several scheduled airlines, including Scandinavian Airlines, Norwegian, BMI and KLM depending on your preferred departure airport. Booking a complete package with Hurtigruten gives you the advantage of having everything smoothly organised for you from start to finish at the same time as your voyage. You will also benefit from protection under Hurtigruten's ATOL licence. Aberdeen, Belfast, Birmingham, Bournemouth, Bristol, Cardiff, Dublin, East Midlands, Edinburgh, Gatwick, Glasgow, Heathrow, Humberside, Jersey, Leeds/Bradford, Manchester, Manston, Newcastle, Norwich and Stansted. Connections and airlines will vary depending on the departure and arrival airports. If you choose not to book flights with us, you can still book transfers for certain routes, as well as pre and post tours, excursions and hotels. All above prices are in £s per person based on two people travelling together and sharing a twin room. Extra nights in Bergen can be booked. Prices on request.